If you do not have the time or tools to make your own cables, Let us do it for you. We now offer cables professionally made and ready to install. All Marine cables are made from Type III stranded, Tin plated copper with a jacket resistant to moisture, oil, chemicals, gasoline fuel and excellent abrasion resistance. Designed to meet SAE, ABYC, UL and Coast Guard requirements, 600 volts, 105*C dry, 75*C wet. Safety standards for electrical and gasoline fuel systems CFR 33 Part 183.(BC-5W2). 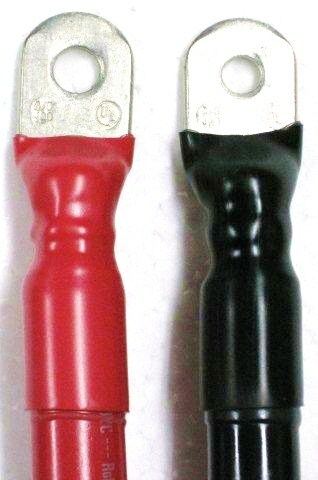 Lugs are crimped and covered with adhesive dual-wall heat shrink. If you need a cable made longer than 40 feet, just email us and we will make it.